What does a primal diet dinner look like? If you and your wife love red meat, buy grass-fed, organic steaks or lamb chops. Season them with salt, pepper, and herbs, and broil on both sides to desired doneness. If you prefer kabobs, try broiled olive-oil-and-herb-marinated steak or lamb kabobs on skewers. Does your wife like poultry? One super easy choice is broiled marinated chicken kabobs. Or you could do something more ambitious, such as roasting an organic chicken. If you and your wife are seafood lovers, consider making shrimp scampi or seared scallops. These tasty morsels are fun to share. Try making sautéed mushrooms—a seductive choice to go with steaks. Steamed globe artichokes, dipped in liquid coconut oil and seasoned with a little salt and garlic powder, are another sensuous option. Or prepare roasted asparagus with olive oil and salt and pepper. It’s a simple-but-elegant side that serves as a nice companion to red meat, poultry, or seafood. With dishes such as shrimp scampi and seared scallops, try a vegetable-based pasta—either spaghetti squash with pesto sauce, which takes more time and effort to prepare, or zucchini noodles, which can be made in a jiffy by buying Organic Veggie Spirals by the Veggie Noodle Co. Simply sauté the zucchini noodles in olive oil or coconut oil for 3–4 minutes. Salad is another vegetable-based staple. Make a Greek-style salad with lettuce, olives, cucumber, red onion, tomatoes, olive oil, lemon juice, and herbs. Or, for something special, splurge and buy a bottle of Primal Kitchen Caesar Dressing and lightly toss it with romaine lettuce leaves and vegetables of your choice. Let’s face it: Most people are going to want something chocolate for dessert. 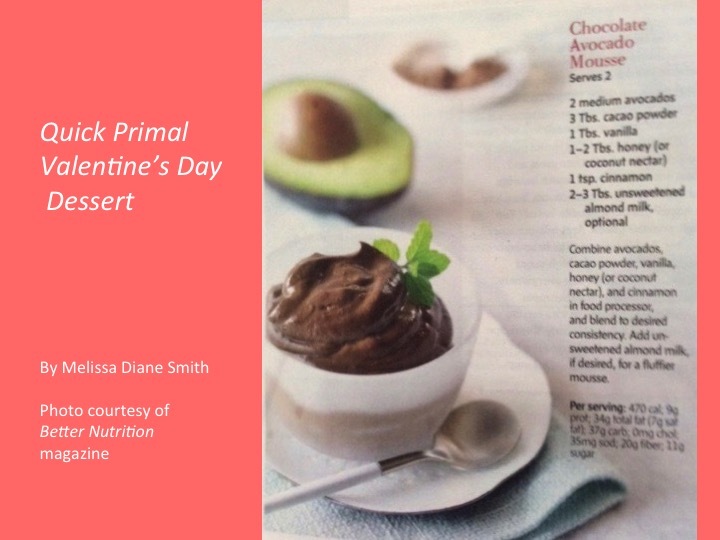 It can be super simple such as our Chocolate Avocado Mousse. If you’re not a chocolate lover and don’t have time to fuss, consider buying Hail Merry Coconut Vanilla Crème or Meyer Lemon Tarts. Made with an almond cookie crust and a virgin-coconut-oil-based filling, these tarts have a luscious mouth feel. Finally, if you or your wife avoids concentrated sweeteners of any type, fruit can serve as the ultimate after-dinner treat. Serve bowls of thawed frozen cherries—they’re delicious all on their own. Or have playful, romantic fun feeding each other orange segments or grapes. Paleo vs. Primal: What’s the Difference? Both the Paleo Diet and the Primal Diet are based on the same principles. They start from an ancestral perspective of what our Paleolithic hunter-gatherer ancestors ate: animal protein, plenty of vegetables, and fruit, nuts, and seeds. Some people think there are big differences between the two diets, and particularly think that the Primal Diet is more lenient with dairy products. That’s not true. Both diets have evolved and now, for the most part, are identical. The truth is that whether you follow a Paleo or Primal Diet, pasteurized and homogenized dairy products should be avoided, but raw and fermented dairy products can be eaten (unless you’re allergic to them). People also think that the Paleo diet is opposed to saturated fats. But that’s not really true either. Both Paleo and Primal Diet advocates approve of saturated fats from “clean,” non-polluted sources. The main difference between the two diets, according to Jeremy Hendon, of Paleo Living magazine, is their origins. Loren Cordain, PhD, popularized the Paleolithic diet with his 2002 book, The Paleo Diet. Mark Sisson wrote The Primal Blueprint in 2009. And that’s basically the difference. The best advice? Follow the diet that resonates the most with you, and focus on the improved health you can achieve by complying with the principles of either one.